Well here we are in August, our last month of one of the coldest Winters in a while. I must admit I do like Winter, I like getting snuggled up in my PJ's in my big comfy chair, in a nice warm house. But I am looking forward to Spring, I view it as a time of not only regrowth, but almost a rebirthing time, a time when we can shake of all the past cobwebs and sprout our new fresh wings for the rest of the year. My "Medicine Wheel" message for August is "Awakening". Now I know what the literal meaning of awakening is but what is the meaning for me this month. Will it be a "Spiritual Awakening, a "Lifestyle Awakening" or some other sort of awakening that I just haven't realized yet. Me being me (I google everything) I googled images of the word awakening and it came up with this amazing sculpture in Washington. 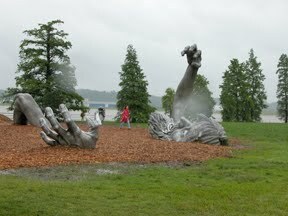 The Awakening is a 100-foot statue of a giant embedded in the earth, struggling to free himself. The statue consists of five separate aluminum pieces buried in the ground, giving the impression of a panicked giant trying to pull himself to the surface. The left hand and right foot barely protrude, while the bent left leg and knee jut into the air. The 17-foot right arm and hand reach farther out of the ground, and the bearded face, with the mouth in mid-scream, struggles to emerge from the surrounding earth. Wish I had have known about it when I was in Washington. Has anyone out there seen it? If you were given the word "Awakening" as your message for the month what would your interpretation be? I would love to hear what your take on the word would be, please leave me a comment with your idea. I wonder how many different interpretations we can get. Hi Davine! Interesting word, Awakening. I just read your post before this one - sounds like you have done some awakening already! To me, that word is all about living what you know or are learning about. Like I'm really having one myself with all the food/health/natural alternative stuff I'm learning about and it's not just a cerebral experience but I'm incorporating it all into my daily life. I didn't see that Giant clawing his way out of the earth but the photo of him seems kind of painful doesn't it? I'd say awakening means a fresh view of things after a long winter's nap. I'd like to think I was rested enough to finally see the new day presented before me so I could take advantage of all it had to offer.